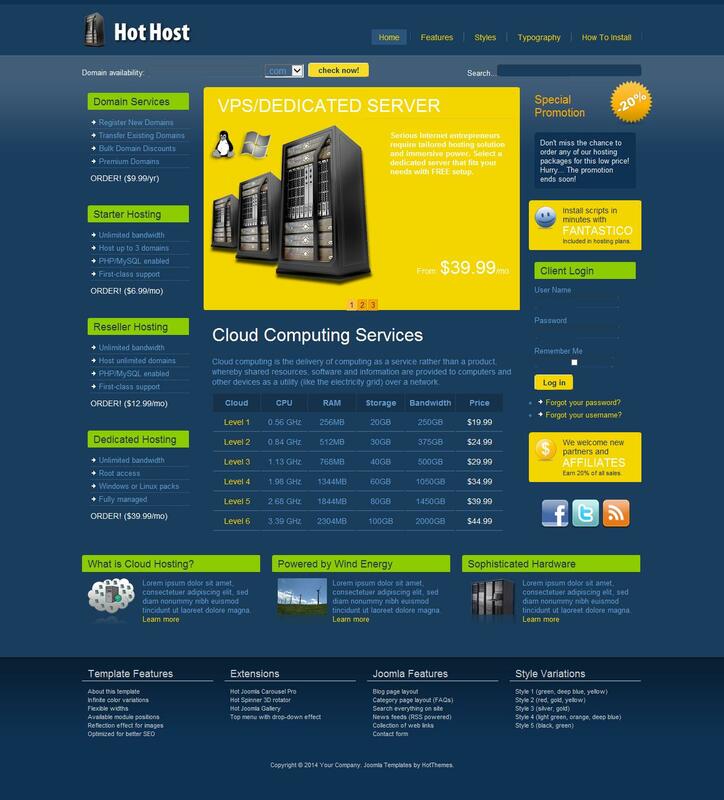 HOT Host - pleasant pattern perfectly suited for creation of sites offering various web hosting sites and dedicated servers. Design pattern is made very high quality, there is a choice of 5 colors of the preset options. Due to the optimized code, the template has fast loading in all modern browsers. In addition to the template and increase functional developers have integrated additional extensions studio Hot Joomla Carousel PRO, Hot Spinner and Hot Joomla Gallery, which can effectively present information to users of the site. Also in the assembly includes an integrated tool for verifying the domain name, which can provide useful information to all clients hosting provider. Flexible modular layout makes it easy to plan the location of units on the site with the ability to customize the desired width of the module positions.